Complete Packaging Station and manifest console with 24" Bubble Pack Bracket. 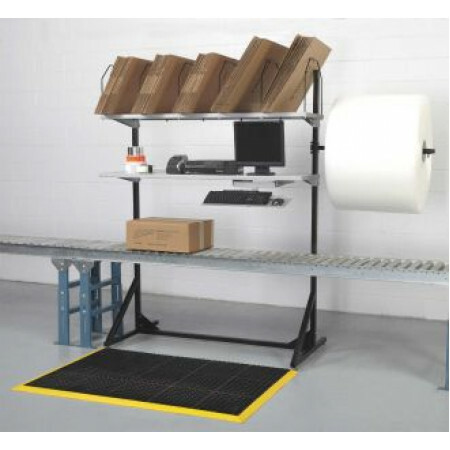 Strong reinforced "L" frame to hold all your necessary packing and table materials above your conveyor system. Bubble pack bracket hold rolls up to 24"
For Adjustable Height Work Tables Click Here! • Carton shelf is 15-1/2" D x 64- 3/4"W each wire support is 16" H.
• Middle document shelf is 64" x 17"H and perfect for packing supplies, envelopes, monitors and informational binders. • Attached is a pull-out key board / mouse shelf. Any of these shelves and drawers can be added to or subtracted from the shipping station. Call us and we can build the exact station you need.